Persia - The first mention of the Persian people is by the Assyrians in the mid-ninth century B.C.. At its height, the Assyrian Empire stretched East across the Zagros Mountains and touched the Iranian Plateau, from which the Iranian tribes originated. The Zagros Mountains create a formidable barrier between Mesopotamia and the Iranian Plateau, making contact improbable between people in both regions for centuries. But by the early seventh century, these tribes began to coalesce into a united kingdom and their presence began to be felt. There were actually two of these tribes which rose independently and competed for the same territory, the Medes (see the mysterious Medes alert) and the Persians. Initially it was the Medes who dominated. But sometimes a powerful leader makes all the difference in the world. 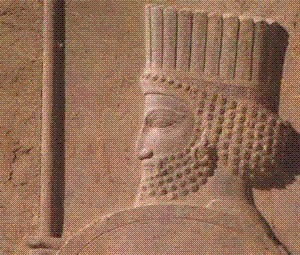 And from the Persians there arose a very powerful ruler; Cyrus the Great. He organized Persia, first into a kingdom, and then into an empire. The likes of which the world had never before seen. Cyrus founded the Achaemenid Dynasty, named after his great-great-grandfather Achaemenes, which would rule the entire span of the Persian Empire (over 200 years). At its height, Persia would stretch from Egypt and the European continent in the West, all the way to the Indian subcontinent in the East, an area of over 3 million mi² (8 million km²), six times the maximum extent of the Assyrian Empire (see map left).